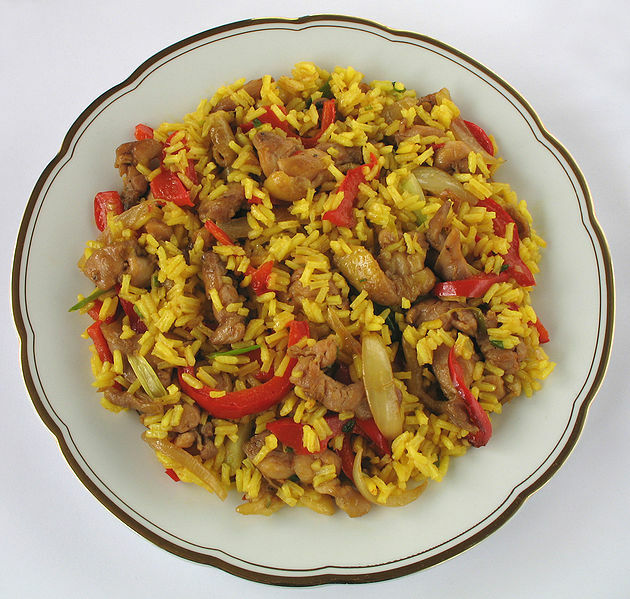 Nasi goreng, literally meaning "fried rice" in Indonesian and Malay, can refer simply to fried pre-cooked rice, to a meal including fried rice accompanied with other items, or to a more complicated fried rice, typically spiced with tamarind and chilli and including other ingredients, particularly egg and prawns. Left: Nasi goreng with curry. In restaurants, the dish is often served as a main meal accompanied by additional items such as a fried egg, fried chicken, satay, vegetables, and kerupuk (meaning crackers or fried potato chips, also called "prawn crackers"). 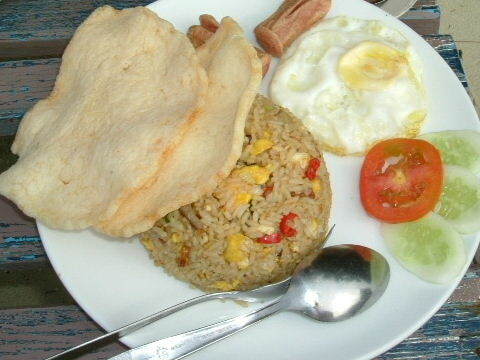 In many street stalls, when accompanied by a fried egg, it is sometimes called nasi goreng istimewa (special fried rice). Left: Nasi goreng istimewa - "Special fried rice".